'Pleasure To Join' - Thalapathy 63 Star On A High! After the success of Sarkar, Thalapathy Vijay has teamed up with one of his favorite director Atlee for a biggie. The venture tentatively called Thalapathy 63 marks the third outing for the mass combo and the second outing for the trio of Vijay-Atlee-AR Rahman. Thalapathy 63 is getting bigger by the day as the team has been revealing the cast of the movie one by one. As of now, the crew has Nayantara as the lady lead along with Vivek, Kathir, and Yogi Babu. 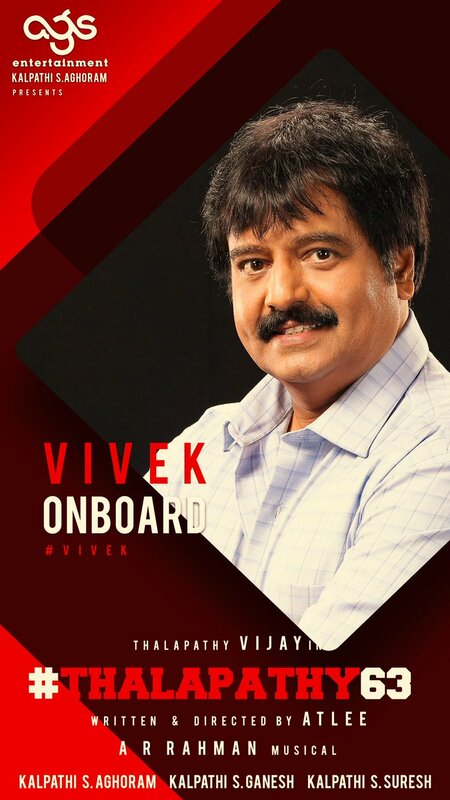 The comedian-actor Vivek opened up about his addition to the cast and tweeted, "Thank u archanakalpathi . Pleasure to join our production house once again"
More details about the crew are expected to be revealed soon as the team gears up for the shoot from January 20th.